I want to wish all of you a safe, restful, and Happy Thanksgiving. This week I am in Minnesota spending time with dear friends. Today, I had the opportunity to visit the State Capitol in St. Paul, MN and see a special exhibit that examines the history and treatment of native people by early settlers to the area. The exhibit challenges the dominant narratives that have been told throughout history that often marginalize people of color. It is an opportunity for many of us to reclaim our own story in American history. This campaign is about all of us reclaiming our unique story of our democracy. I’m thankful the opportunity to run a campaign powered by your support, ideas, and most importantly your energy. Thank you again for all that you do for this campaign and Happy Thanksgiving! Brandy Brooks is a progressive candidate running for Montgomery County Council At-Large. Brandy Brooks, a Democrat, is running for an at-large County Council seat. Brooks filed her campaign paperwork at the Board of Elections offices on Friday. Brooks is running on a progressive agenda that includes providing better housing for those in need, improving public transport and increasing the wage. She said her run for office was inspired, in part, as a response to Trump’s victory, but that she also felt an obligation to show other people of color what was possible – and in doing so create the kind of diversity Sanders addressed in his speech. I endorse Brandy because she is a visionary with the chops to back her ambition with keen study, observation, and and peerless work ethic. She holds herself and all around her to a standard of integrity that holders and aspirants of higher office would do well to reach for. Brandy is the real deal! I know Brandy from years back, know her for her commitment to social and economic justice, her ability to navigate her way around the ‘business as usual’ types and she’s a great joy in life. Also she is really practical and competent. A community organizer has entered the at-large race for the Democratic nomination for Montgomery County Council. “I’m running because I’m so excited to be working for a Montgomery County that works for all of us,” said Brandy H.M. Brooks, 40, of Wheaton. She said the county has abundant resources, which should be equitably shared by all. Brandy, I’m so thrilled you are doing something amazing for the people of Montgomery County and running for County Council. I hope you have a great birthday and an amazing year as we build your campaign together! Brooks, a progressive activist and organizer, said she is running for County Council At-Large after talking to people in her community. Brooks, originally from Massachusetts and a member of the political advocacy group Progressive Maryland, said her campaign is focused on “social justice” to bring more equity to the County’s racial minority groups. I support Brandy for County Council because she has a clear vision. She is dedicated to making positive change and is a systems thinker. Brandy makes connections to address challenges and is proactive in building meaningful relationships. She is exactly the type of progressive candidate we need. If we realized how much power we have, we would flip this table! The power that currently controls both parties is not going to turn over that power to progressives, it’s not going to turn over that power to immigrants, it’s not going to turn over that power to women of all colors and kinds, without a demand. It’s not going to yield itself up without us organizing and requiring that it listens to us. Following President Donald Trump’s recent statement on a white supremacist rally in Charlottesville, Virginia that left one woman dead and dozens injured, a few Democratic candidates running for the Montgomery County Council and a candidate running for the Maryland House of Delegates, held a news conference early Wednesday to denounce Trump’s statement. During a news conference with reporters held in New York City earlier this week, Trump answered questions about Charlottesville and his response to the rally. “You had a group on one side that was bad and you had a group on the other side that was also very violent,” he said. Disappointed by his statement and “inability to call out white supremacy,” Montgomery County Council At-large candidates Brandy Brooks, Hoan Dang, Danielle Meitiv, and Chris Wilhelm joined District 20 Delegate candidate, Lorig Charkoudian, to criticize the president’s statement. I believe Brandy is an excellent example of somebody who will be responsive to the people. She has a lot of community organizing experience and that’s exactly the type of person that I want in an elected position. Somebody who is use to listening to the needs of people in the community and taking those needs and creating change with that. Seven Montgomery County Council at-large candidates fielded questions from members of three development groups Wednesday, the fourth and last forum for the crowded at-large field. The candidates largely supported the recordation tax, a levy imposed on the transfer of property. They said the money was needed to fund the capital needs of Montgomery County Public Schools. The organizations that hosted the forum were the Greater Capital Area Association of Realtors, the Maryland Building Industry Association and the Apartment and Office Building Association. The seven candidates were Gabe Albornoz, Shruti Bhatnagar, Brandy Brooks, Hoan Dang, Lorna Phillips Forde, Danielle Meitiv and Councilmember Hans Riemer. The organizations had hosted four previous forums with most of the 22 other candidates. Vibrant education systems, sound transportation and viable infrastructure systems were mentioned as amenities. Brooks said fees play a role to support public infrastructure associated with new construction, and it’s important to make sure the fees are being correctly directed to the projects they are support. She listed code enforcement and green energy programs as examples. 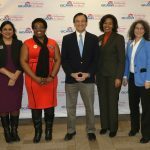 The Montgomery County Education Association — which issues the influential “Apple Ballot” list of political endorsements — backed several candidates in crowded county council primary races on Thursday but held off making an endorsement for county executive. The teachers union, which represents about 14,000 educators and specialists, endorsed three candidates among the 38 running for four at-large seats: Democrats Brandy Brooks, Will Jawando and Chris Wilhelm. Biscuits and Ballots? Food and Politics. Brandy Brooks has roots in The Food Project, a sustainable agriculture organization in Boston and a food justice nonprofit in D.C, Dreaming Out Loud. Brooks has been a long time champion of local food, sustainability, and food justice and she is bringing all that passion on the campaign trail. I endorse Brandy Brooks because she speaks about the real issues in the county. She is new to politics, but she knows where the challenges lay and she has constructive ideas & plans for how to address those challenges. She is a genuine, down to earth citizen of this county. She spoke about preserving and honoring our county’s history, while embracing our future in a way that is congruent with the values that are so important to us. I honestly believe she is a different kind of candidate, a person I could approach with my concerns and questions. She doesn’t skirt the tough questions about transportation and corporate growth in the county; she sinks her teeth in, tells you what she thinks, and then asks for your ideas, too. Brandy represents the real Montgomery County, the everyday people who live here, who run our favorite “mom & pop” businesses, who teach our children, who are making advances in technology, who are researching cures for diseases… Brandy is the real thing. Authorized by the Brandy Brooks Power Posse, Carol McSween-Brooks, Treasurer ThemeSLR template customized by MCW Creative Group.